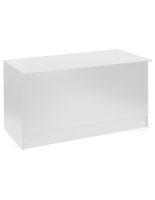 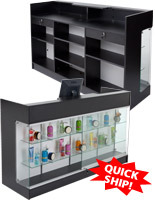 These 60" counters & cash wraps are ideal for use in retail stores because they great larger displays that are sure to catch the attention of visitors. 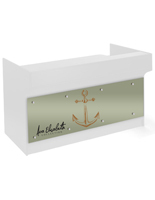 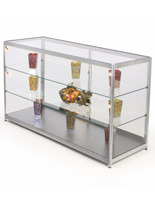 Each fixture features a neutral finish that complements any environment. 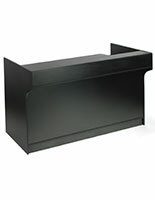 These include white, silver and black. 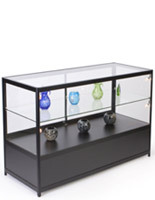 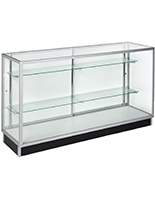 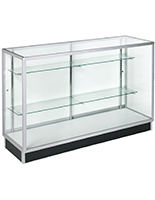 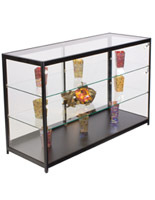 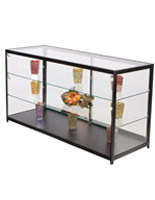 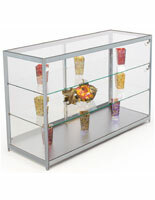 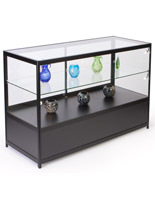 The display cases in this category are made with tempered glass, a material known for its greater strength than normal glass, and if broken, its ability to form smaller chunks instead of jagged shards. 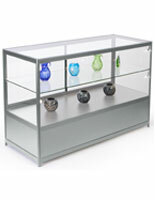 This also adds a slight green hue to the edges of shelving, creating a sleek and attractive appearance. 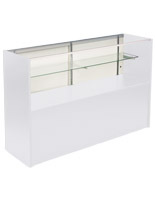 These counters & cash wraps feature strong frames as well, made of aluminum, laminated particle board or medium density fiberboard. 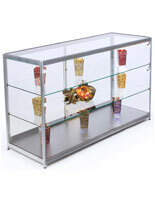 This allows the displays to withstand high traffic environments. 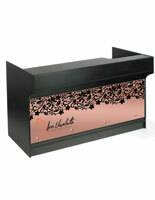 Which locations are suited for counters & cash wraps like these? 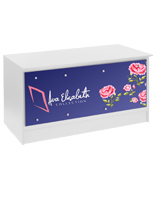 Retail stores are the first places that come to mind when looking at these stands, but they can also be used in schools and museums or they could be taken to events like trade shows. 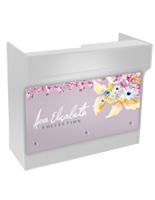 72" wide fixtures are ideal for placement in commercial establishments because they can be used in checkout areas and hold cash registers. 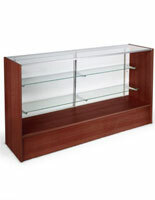 Some of these units come with a custom graphic that can be used to showcase a company's logo or branding information. 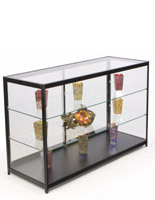 This artwork panel is affixed to the front with pieces of acrylic and standoffs made of aluminum. 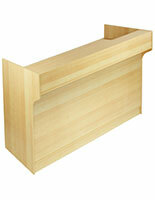 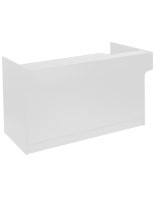 These models also feature a ledgetop counter for writing checks, adjustable shelves and a pull-out drawer. 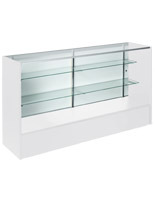 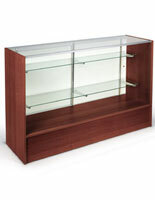 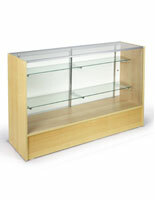 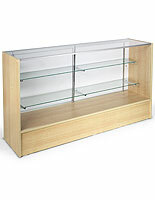 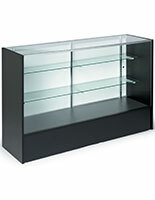 Another type of fixture is the half-view cabinet that can display merchandise on its clear tempered glass shelf. 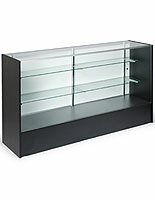 Underneath the shelving area is a storage base that can only be opened from the back. 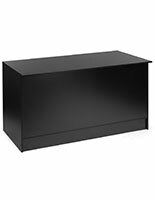 This hidden storage cabinet can be used to keep supplies out of sight. 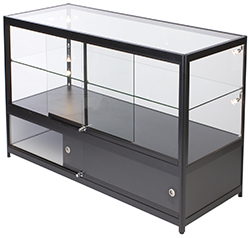 The last type of stand available here is the full view display cases that features (2) tempered glass shelves for (3) showcase areas. 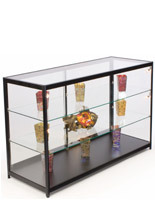 Most units feature a locking design that allows users to protect their valuable objects from theft and tampering. 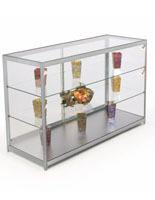 They can also come with illumination via LED or halogen bulbs for extra visibility.